Crown over 'A' Pottery Mark Query:- When clearing out my mother-in-law's house (she moved into a residential home) I found a figurine of a young peasant girl feeding a goose. It stands about 6" high. 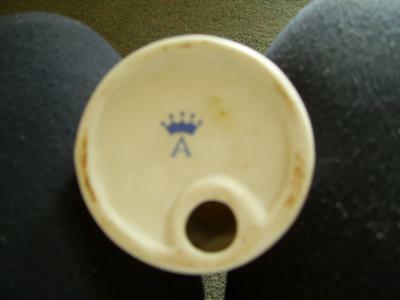 It has a pottery mark on the base of a dark blue crown with the letter 'A'. My mother-in-law has given me the figurine and I would like to know more about the potter's mark? This Crown over 'A' pottery mark is not an instantly recognisable one from a well known high quality maker. It has the 'Naples' type crown typical of German makers paying 'homage' to Capodimonte, but normally these marks have an 'N' or an 'S' under, not an 'A'. It's hard to say what type of maker it is without a photo of the item, but my guess would be a small German manufacturer or possibly even Far east Importer. Perhaps you could upload a photo of the figurine for us - here's a shortcut to the submission form for the pottery marks public forum. Note to all visitors: it's always best to send in photos of both the pottery mark AND the item to stand a chance of getting a good answer on these pages. Sorry I can't be of more help at this time. If anyone has the answer to this pottery mark query, please leave a comment below. I Have 2 piano babies with this mark on them - I'm still trying to work out who's mark it is! So, if you ever got an answer, I'd love to know!!! This is one of the longest outstanding unsolved mystery pottery mark on this website. We have even sent the mark to the expert mark researchers, with no joy. Anyone with information on this marking A beneath Crown, please shout and earn a gold star and brownie points galore from all of us!! i actually have a few figurines myself with that marking on and it seems that no one online knows where its from. the extra thing mine have on them is that it has foreign written underneath. Just another individual who encountered this mark. I do have a photo of the figurine: a blonde female wearing a long dress with petticoats and holding a hat with red ribbon on it. This figurine was found with a second figure that looks quite similar, except for color of dress. My thought is that's it's a Japanese mark. I have a family of otters figurine with this marking underneath and your page is the only one that mentions it! I have a bullfinch sat on a branch with the same markings. I have been given a lady in a pink dress with blue petticoat underneath holding an umberella with the crown and A underneath.I know that it is at least 80 years old but thats all! Doesnt look to me like its worth much as its not perfect, but would like to know some history on the maker! I also have a pig with this mark on and cant find information on it. Please let me know if anything comes to light! my friend has the same marking's, only payed 50p for it, dont know any info abouyt it :/, any help ? THIS IS THE ANSWER FOLKS!!!! I have a little "Birthday Girl Figurine" which has the exact same mark, a blue A with a crown above. She also has a gold label around her neck which reads "Hand Made Porcelain Alfro London" and "Foreign". Neither the label or the figurine look old... Is that enough to get me a brownie point or a gold star? Although I'd rather have a chocolate brownie and forget about the gold star altogether. The Chocolate brownies are on me! That's why I love this website - people like you solving impossible mysteries no one else online has every solved! So the marks stands for Alfro London. I suspect the inclusion of the word "FOREIGN" means Alfro was perhaps an importer/wholesaler rather than a maker - which explains why this mark is in none of the books. Obviously supplying the UK market in this instance. If there are instances of these pieces being found abroad, then it is quite clear they were bought in the UK as souvenirs. This is the only page online (possibly anywhere) which has the solution to this pottery mark mystery. Therefore, if you use this website as your source of information, please give us accreditation. Thanks. we too have a admiral in a red tunic with white trousers with a sash over tunic and a sword to the side and a black nelson like hat, with the crown over a A = any ideas? This 'crown over A' pottery mark is attributed to "Alfro London" - an importer of wares into the UK, as discussed in the last two comments. I have just acquired a very sweet china pierrot boy, holding a small black horn/bugle in one hand, with other hand on hip. This one has a GOLD crown over A backstamp. No 'foreign' mark though. Do you think this is also imported by Alfro? It looks quite vintage. I thought it would be German or Japanese - but absence of 'foreign' mark makes me wonder. Yes, I believe this a Alfro - probably made in Japan in the 1950's (possibly the GDR maybe). The 'foreign' was at one time a legal requirement, but is no longer as it is regarded as a 'restrictive practice' which inhibits free trade. People got round this legality by the loop-hole of putting on a sticker which was then conveniently removed (probably by the retailer). This is commissioned by Alfro (an importer to the UK and possibly elsewhere), and likely made in post-war Japan (see submissions above). I would like to say A huge Thank you. I have a black and white Spaniel dog with this marking, I have had for 10 years, and could not identify the maker. Well done mystery solved, you have made my day :)I have now bookmarked this site. I'll have to check this Alfro pottery! I have a small basket of fruit with a similar mark. The crown is not the same style. Also no foreign mark. But there is a number marking of 22 / 342. Should I submit a separate query with a picture? I think this is likely the same importer. Reasons for no foreign mark is this stopped being a necessity for more modern imports. Also foreign was often placed on a sticky label which came off. Hi, I have a complete set of King Henry viii & his six wives with this mark on the blue crown with 'A', does anyone know if they have a collectors value please? you can email me at: [email protected] if you can help me. i also have a figure from my mother's collection with this mark. Your site was the second I had looked at to try to identify the mark and you solved it for me. Briliant! I have one as well. How do I value them? I was researching a little Pink Pig that I have which has a Crown over "A" Mark. So I was delighted to find the "Solution" to the mystery on your Site. However, I bought another piece of pottery more recently which throws some doubt on the "Alfro" name. The new piece is of a Robin feeding her Chick. But the Base has a Full Stamp which in addition to the Crown over A mark, also has "Alfretto Porcelain Collector Series Foreign" within some Scrolls. Whilst this confirms the Foreign Import suggestion, the Distributor's name seems to be "Alfretto". Many thanks for this great information. Seems to me, Alfro is just a shortened derivative of "Alfretto". Just a tweaking of the brand for some reason. Same importing company based in London wholesaling mass-produced china trinkets, same mark. I have a lady wearing full length dress with the A under crown. Mine also has the gold sticker with Alfretto porcelain on it. I just assumed that alfretto was a maker now I am not at all sure. Alfretto (aka. Alfro) not the maker as such, just the importer/distributor. Goods sourced in Far East and other exporting countries making mass-produced lines. i have two little baby boys one lying on his back and the other one sitting up. thanks for letting me know the background to these!! Only site with crown over A can you help with this figure. I have a dog with the crown and A mark in silver, he is sitting and looks like a lab x spaniel !! Got passed him down to me at least 10 years ago and was thinking of selling him at a Carboot or something, should I now be considering keeping him? I wouldn't think these have much of a value yet - they are too young and too mass produced to have anything much more than sentimental, decorative or kitsch value (not any real collectable or quality value at all). Just back from a jumble sale with a figure of a pied wagtail with the same A above a crown mark in blue on the base. This figure also has a paper label (gold with black print) bearing the same A above a crown mark and the words "Hand Made Porcelain" Alfo London" and "Foreign". So I'm able to confirm the identification already made. The piece has a matt glaze and the body is very hard. It seems to me like a cheaper, cruder version of Goebel bird figurines that I have come across, produced for the less well-heeled. It's attractive enough, though, and at 20 pence I'm happy to own it! "Paris (Rue Thiroux). In the undeglaze blue". the antique book I got this information from is dated 1971. 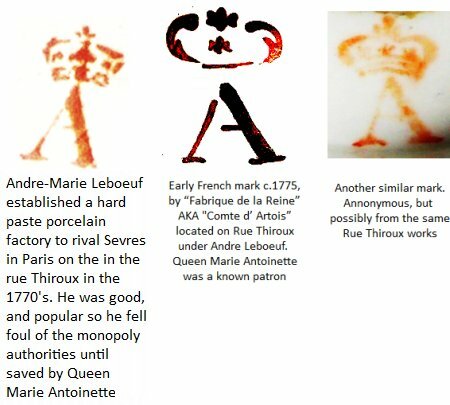 I really appreciate the last poster's comments as it brought up something I was not previously aware of - that of a really important 18th century maker using a capital 'A' letter with a crown - that of Andre-Marie Leboeuf's works on the rue Thiroux, Paris. However, the letter 'A' mark we are referring to on this thread is NOT to do with this maker - we are talking about a mid to late 20th century mass-produced importer of trinkets, rather than the priceless and faultless Parisian work of Leboeuf in the 1770's. He established a hard paste porcelain factory to rival Sevres in Paris in the rue Thiroux in the 1770's. He was good, and popular so he fell foul of the monopoly authorities until saved by Queen Marie Antoinette, who said he could use her 'A' initial. His work is exquisite and valuable. Alfro is not. Just keeping us on track! All comments always most appreciated - especially when based on painstaking research. A with a crown over it (as in the original photo at the top of the page) is 'Alfretto porcelain' make, or sometimes called "Alfro". I have bee given by my mother in law 2 piano babies a little boy and girl both laying on their backs and both have a capital A, with a crown over the top.i was told they are over 50year old, would thate right ? inherited a pig with this mark, still has the label tied round neck. pig is about 7" and is sitting. no idea of age though. Any photos would be great! Is it possible for you to take some pics of your pig, and the label? I have an ornament which comprises two geese (white with yellow beaks and feet). The ornament has a matt finish and is quite charming. I must have inherited it or been given it as a gift because I know I didn't purchase it. I had no idea what the pottery mark was but thanks to your website I do now! Thanks. I always see it linked to "Alfretto"
I have some napoleonic porcelain soldiers with this mark on and on searching eBay and google it seems to be Alfretto. I have just paid 50p in a car boot sale and now own a sad faced clown with a ball at his feet, it has a gold label with A under a black crown and says foreign, I fell in love he looks so sad with his little pink hat he is cute. Can anyone give me any info please. I too have a figurine with identical markings to your picture. it is of a baby boy, lying on his back with feet in the air and is very well hand painted. I just picked up a pair of figurines of a man and woman in flo blue with Gold highlights.The elderly couple I purchased them from believed there parents brought them back from Italy close to 50 years ago. The crown over A is very different from the ones shown in this thread.I would like to add a photo of the mark and figures. CROWN 2 A'S AND BAVARIA NAME AGE???? I have two figures with this blue mark - a boy and a girl with their hands clasped in prayer. On the base of one of them is a foil sticker "Made in Taiwan"; so I don't think these figures are very valuable. I have a fine quality coffee can in hard paste porcelain with a panel of hand-painted flowers and good gilding. The mark is a faint crown over A in red, similar to the outer two Paris marks shown - and distinctly different to the mark shown at the top of the page. I have a set of 3 pigs with a blue crown and an A stamp. How much are they worth. The crown is a basic one with little dots at the top of the peaks. I hope this helps anyone, and also I hope this will help me to find out how old they are, not to old looking at a sticky label. P.S. have found a whole box of things, a few miniature plates, and mini miniature plates, plus small vases and a dressing table set. The symbol on the back is in gold, and looks like peacock feathers over the letter A. It doesn't look like anything like an alfretto mark. Any ideas? I can't find it anywhere. Yesterday I bought a plate with vaguely Chinese or Japanese floral design and an elaborate cut-out rim. The manufacturer's mark looks slightly Germanic too. 99p from the charity shop. Quite pretty! I have just sold for £1.50 a pretty biscuit porcelain bird figure with THIS CROWNED A!! I just Googled this as I have the same mark on an ornament with a guy playing a fiddle, and a dog is sat next to him. Hope it helps. I have a pair of figurines with black crown over A.Boy and girl both holding a lamb with one lying at each of their feet.I have had them for over 30 years. I have a pair off small brown birds, possibly wrens, with the blue crown and A mark. I was hoping to find somewhere to purchase a replacement as one of them had an unfortunate meeting with my husband so it’s quite badly chipped. But I suspect I’ll just have to keep on searching at boot fairs. its a simple looking tiara like crown... does anyone know who that is? I cant see how to upload pics? ?